This is an updated version for the Instant Pot of a Philippine adobo dish, which is a cooking process in Filipino cuisine that involves meat, seafood or vegetables marinated in vinegar, soy sauce, garlic, and black peppercorns, which is then browned in oil, and simmered in the marinade. It has sometimes been considered as the unofficial national dish in the Philippines. Place the chicken thighs, skin-side down, in a 6-quart or larger Instant Pot. Add the vinegar, tamari or soy sauce, garlic, Sriracha, bay leaves, and black pepper. Secure the lid on the Instant Pot, then make sure the valve is in the "Sealing" position. Set the Instant Pot to Pressure Cook on High for 15 minutes. Allow the Instant Pot to release its pressure naturally. Meanwhile, line a rimmed baking sheet with aluminum foil. Arrange a rack in the middle of the oven and heat to broil. Open the Instant Pot. Using tongs, transfer the chicken skin-side up to the baking sheet, and set aside. Press the "Sauté" button on the Instant Pot and set the timer for 10 minutes, stirring occasionally and mashing the garlic in the sauce with a wooden spoon, if desired, so that the sauce can reduce. Broil the chicken until nicely browned, rotating the baking sheet as needed, 3 to 5 minutes. Keep an eye on it to make sure it doesn't burn. When the sauce is reduced, taste and season with salt and additional pepper as needed. Discard the bay leaves. 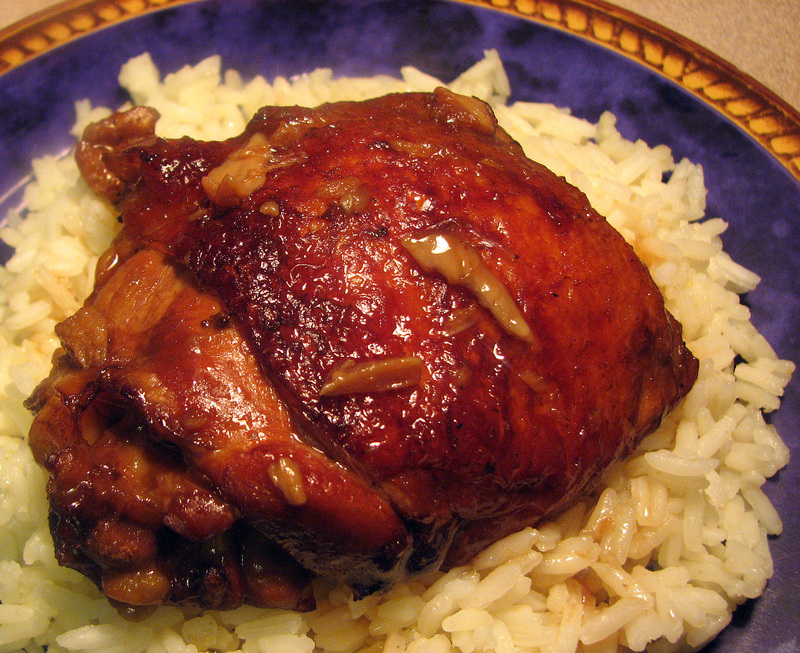 Serve the chicken thighs with steamed white rice if desired, and ladle the sauce over the chicken and rice and top with the scallions.